Here is my great taste for this beautiful Tuesday! This is a salad that you can take anywhere! 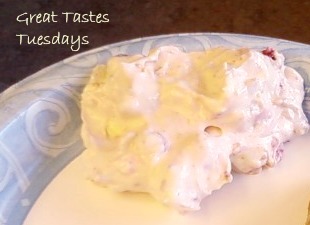 It is so sweet and yummy you will want to go back for seconds! This is so easy! All you need to do is mix all of these together and wah la! It tastes so good. This makes enough for a large group so if you want a smaller serving only do half of each ingredient! I love this! Fresh fruit is really good too...if its available! This looks so yummy and fresh! Plus a great alternative to higher fat ice cream! Thanks so much for linking up at Crafty Tuesday! It tastes so good! A great alternative! I eat this over dessert for sure!